STORM'S IN-HOUSE TESTING EQUIPMENT ALSO ELIMINATES TRANSPORT COSTS. Quality inspection and testing throughout the bus bar production process to ensures all specifications are met, once more eliminating fuel consumption and pollution from transport from plant to lab. Find out what we mean. 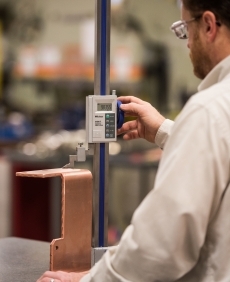 Storm maintains total control over its copper part manufacturing process from beginning to end. This ensures our ability to respond quickly to our customers’ product specifications and delivery needs with nothing less than superior quality. And, when we give you our word, you can bet on it. That’s why, for more than twenty years, we have earned the repeated trust of respected brands worldwide to deliver the right part—right when they need it. Every Order. Every Time. Team Storm is fixated on meeting customer requirements by providing innovative, cost-effective solutions and focusing on continual improvement of all our products, processes, and services. When it comes to precision tolerances, rigorous quality standards, and PPAPs, we know the drill.